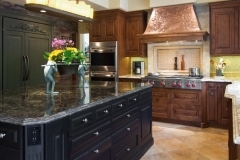 Traditional Kitchen in Tustin | Le Gourmet Kitchen Ltd. 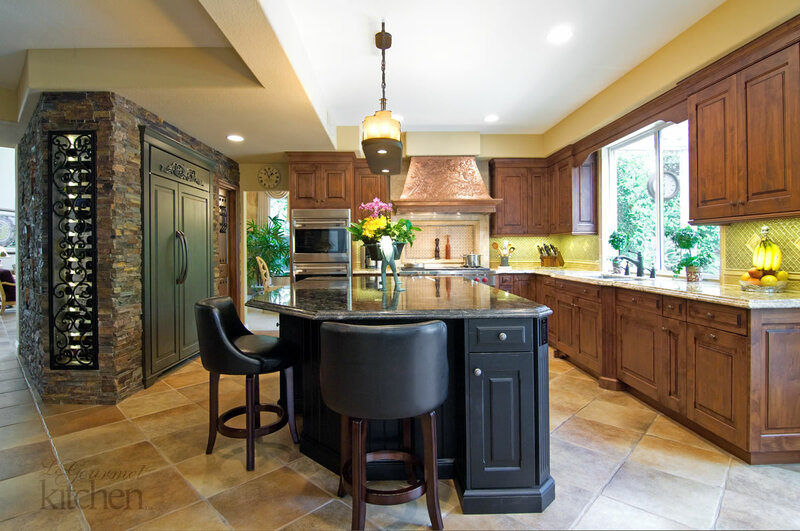 The traditional allure of this kitchen design in Tustin permeates ever aspect of the space, from the dark wood beaded inset cabinetry to the Archive Design custom hood. As the hub of activity in the home, a kitchen sets the tone for your home style, and this kitchen remodel was designed to be a style icon. The deep, rich tones of the Bentwood Luxury Kitchens cabinetry include dark wood finish perimeter cabinets and a black finish island.The cabinets are complemented by granite countertops, and the island includes two barstools for casual dining or to allow guests to socialize while you cook. An undercabinet wine refrigerator, wine storage area with backlit LED lighting, and custom tiles with embossed wine tags are a perfect addition for a wine connoisseur’s kitchen design. The custom bar offers a unique feature for this sociable space, including a backlit bar sink and LED lighting under the featured Grey Goose vodka bottles.The fireplace has a water feature and a custom wrought iron fireplace gate. 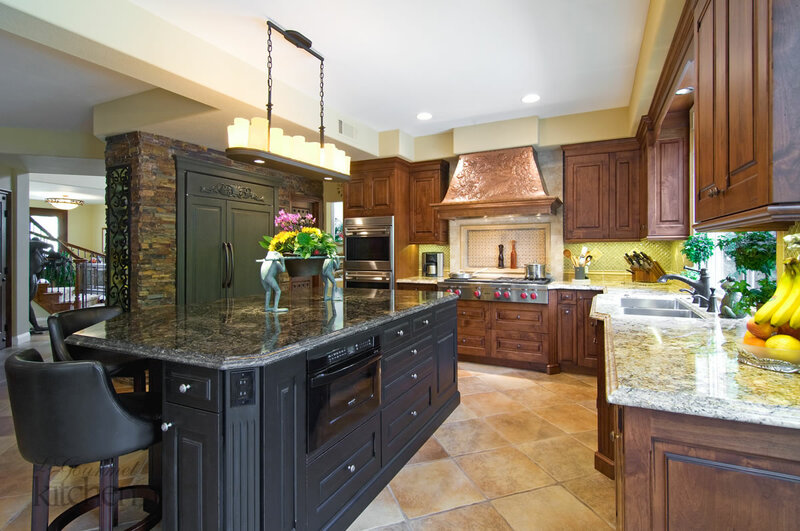 Texture and color play a significant role in this kitchen design.The Archive Design custom hood is a hammered copper embossed metal hood and adds a stunning focal point to the design. Candle niches with hammered copper backs complement the custom hood, and the Ledger stone walls add depth to the style of the space. The wine storage includes a custom wrought iron gate that pairs perfectly with the surrounding stone and wood tones and adds a one-of-a-kind appeal to the kitchen design. The lighting scheme plays a key role in this room, with a combination of the undercabinet lighting, targeted task lighting, and a unique island chandelier, along with a backlit wine storage and bar. Top of the line appliances make this a perfect spot to entertain, including a Sub-Zero refrigerator and a Sharp built in microwave.